Today, in commemoration of my ten year anniversary of profession, I break retreat for a brief instant to share my gratitude that God would take me to be His own. So, rejoice with me today, that God loves us in such a way that He, the Maker of the stars of heaven, would stoop down and espouse Himself to a mere creature such as myself. In reading Simcha’s post, I could relate with her on many points, even though I have never given birth to children of my own, I have had to grow into my own ‘motherhood’. Ever since I was a small girl, I had an aversion to barbies and dolls, preferring to care for animals instead. Maybe it was because the dogs, cats, rats, rabbits and hamsters were really living, breathing things, rather than plastic and immobile objects. Yet, I also remember the first time I held a real baby, my little brother Michael. I was afraid I would drop him, and so instead of holding him with love, I held him in fear. On the other hand, I had from a young age an affinity for Mother Teresa of Calcutta. I remember my first introduction to her when I was seven. I was sitting in my Nana’s playroom, and of all the toys she had in the closet for us, I would always go to some books in the corner of the room, a series of them had a section on countries and cultures. One day, the book I picked up was featuring India and the story of Mother Teresa. What struck me was, in fact, her caring for the broken human beings she encountered with great tenderness and compassion. The story made me ponder how was it that she could care so deeply about these whom she didn’t know. What was it that made her pick up that first dying man on the street? Was she afraid she would ‘drop him’? That he might die in her arms rather than get well? My ‘awakening’ to my calling to be a mother to others first came the summer after my first vows, in 2002. I was helping with the summer program for Catholic youth in Vimercate, Italy. I was playing futbol (soccer) with the children, and managed to score a goal. The boys started cheering, “Madre, Madre, Madre!” I was looking around to see who they were talking about – who is this ‘Mother’ they were shouting for – sheepishly remembering that is the title the Italians use for religious women – Madre. Mother. It was a moment of reconciling for me, both my call as a celibate who, under a vow of chastity, chose to follow Christ in this way, offering my own motherhood to God and in doing so became a mother to God’s children, all humanity. It is an overwhelming thought. After ten years of professed life, I am still discovering what it means to love those who are not my own, and in the process understanding more deeply my own vocational call to religious consecrated life. As Simcha mentions in recalling her own experience, it was – and continues to be for me – a growing into motherhood. The key to its success is not our inbred feminine disposition for nurturing (although I imagine having it, makes the motherly role come more naturally), but more important is one’s steadfastness in their living out their vocation. This makes sense reading Simcha’s words, “I was already fully surrounded by my offspring before I started to feel really comfortable or confident in my role as mother.” These words ring true in my own experience, the importance of living faithfully our calling goes way beyond one’s feelings: it is commitment. This idea of commitment plays out so true, recalling my own childhood, being one of seven children. We were a handful for my mother, that much I remember, often teasing each other to tears. I often wondered what superpowers my mother was endowed with by God, by the very fact she did not lose her sanity in the process of raising us. When she said her ‘yes’ in marrying my father, that yes meant accepting the fruit of their marriage – children. The late nights caring for us when we were sick; and later picking us up from detention after school. The sacrifices to the things she would have liked to have had so that her children would have opportunities. Now that I am grown, I often reflect on her motherhood as an example for my own. I am sure there were times she was fed up with us and our craziness and wanted to get away, yet she stayed the course, loving us even when we showed little or no signs of appreciation. This is the motherhood that I strive for. Here are some ways I celebrate my spiritual motherhood. On one hand, I think of the desert Fathers and the many who would come out to the desert to pray with them and find sound counsel. In this way, I see myself a spiritual mother when I take someone under my wing to help them in their spiritual journey, by sharing from my own experiences the workings of God. I also feel I am a mother in this sense as I carry in my heart all who ask for my prayers; my heart is burdened for their concerns, their sufferings, and my heart rejoices with them in their successes. This plays out big time in the classroom, teaching catechesis, working with youth; the need to be attentive to the heart of those in my care. I am also a mother by my call to availability, to be willing to interrupt my day when I encounter someone in need. It happens from time to time that I am stopped along my way by others because of my habit – the exterior sign of my consecration – and asked to talk with them, or pray with them. These are pinnacle mother-moments. Where through being present to these strangers, I present them to the Heavenly Father, and Jesus, His Son. Some of these moments hold me in dread, not knowing how to respond, much how I felt when I was five years old, holding my little brother in my lap. Thus, the Holy Spirit becomes my companion, that God’s word may reach the soul in front of me, that I might be given words to say to him. These encounters have strengthened my desire to take each person who I encounter and love them, realizing that their Heavenly Father would want it so. During this month of May, my community is praying from “A Guide for the Canossian Community in Prayer”, a recommended prayer of intercession through Mary. We’ve had a growing awareness over the weeks, as we pray, of the echo these words contain with the reality of what is happening around us. I wanted to share it, offering the prayer for the world, and for the many who find themselves living what these words contain. Perhaps, you may wish to join us in the last days of May praying this prayer with us. Look down on us, O Mary! daughters of Charity, the queen of virtues. Look down on us with the benevolence of a mother. with an upright heart and good will. and are carried away by brutal passions. and the sacrifice of defenseless and innocent victims. But you, Mary, are the Mother of Mercy and Forgiveness. and the communion of evangelical charity. in the Spirit of the love of your Son Jesus, our Savior. 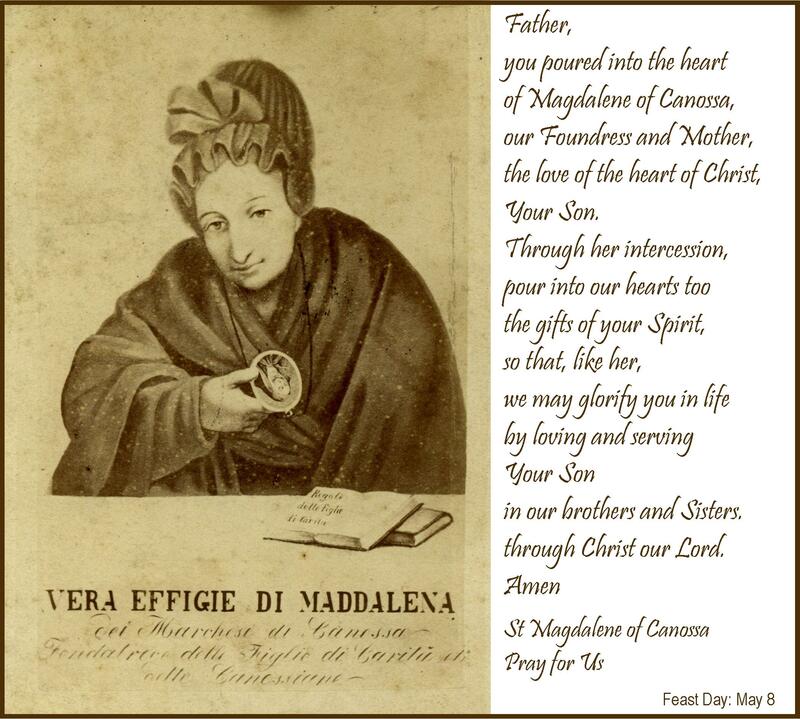 My Religious Family celebrates its feast day today (May 8th), Feast of our Foundress Saint Magdalene of Canossa, and the Foundation of the Canossian Daughters of Charity – Servants of the Poor (Canossian Sisters), on May 8, 1808.
our hearts are united with you in thanksgiving to God. Each of us religious sisters and brothers, priests, lay persons and volunteers, is Canossian by the charism we all share. But just as each of us is a unique creation of God, so too is our expression of the gift (charism). The charism gives us our name (Canossa) and creates a strong bond between those who bear this name. 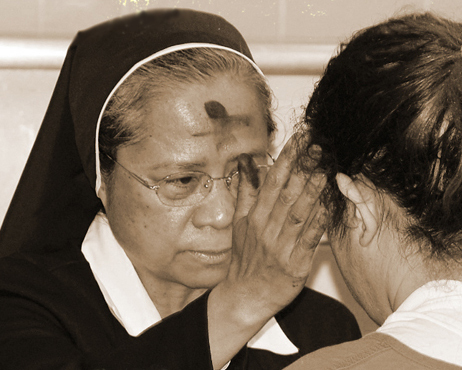 We Canossian Sisters strive to address the most pressing needs through the following expressions of Magdalene’s charism: education, evangelization, pastoral care of the sick, formation of the laity and spiritual exercises. 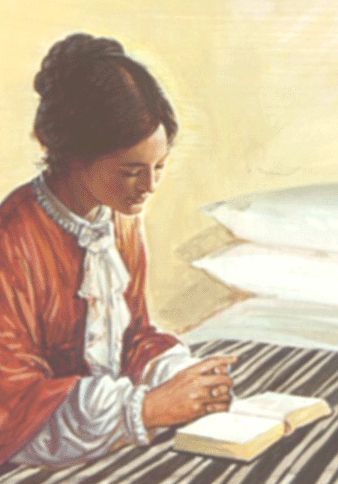 All is done to fulfil Magdalene’s dream: “above all make Jesus known”. We Brothers and Priests witness to the love of Christ Crucified by responding generously to the needs of the times and the place where we are, in accordance to the local church, through activities such as: Catechesis, Assistance to the Youth, Youth Centers (Oratory), Works of Charity towards the poor and the least. We Lay Canossians, discovering that we are in harmony with the charism of Magdalene of Canossa, feel called to live the charity of Christ Crucified in a secular dimension and ask to share in the Canossian family’s life in order to collaborate with the Daughters of Charity (and Sons of Charity) in their ministries. We are lay men and women, youth and adults of diverse nationalities united in the great mission of human promotion and evangelization. We offer opportunities to grow in faith and for one to share their gifts through an experience of Community, Spirituality, Formation and Service. One of our past-volunteers shared a day in her missionary life at this blog here. These words from the Gospel of John, chapter 14, verse 1, present the theme for the young women’s day retreat hosted by the Canossian Sisters of Sacramento (my community) on Saturday, May 21. Details about the retreat are available at their website. If you are a young woman in the Sacramento area, consider coming, reflecting on the Word of God, and getting to know us! We’d appreciate very much your prayers, so like our April retreat, this too may be successful!